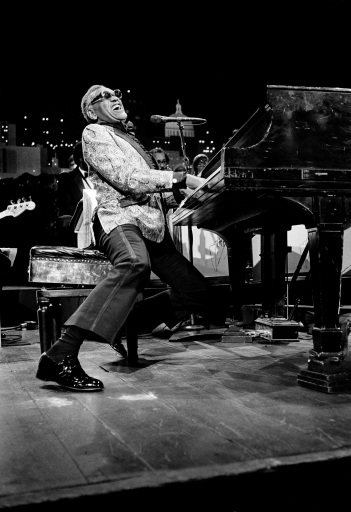 Here’s one of the greatest musical forces of our lifetime, Ray Charles, in full channel. He was at the height of his game, 21 years ago, and all his powers were on display. This is one of those shots where I saw him do the revealing thing, rear back like this and belt it out, but just momentarily, and I missed it…… So I waited him out until he did it again. Click. The automatic signal of a great shot, to me, is when the hair stands up on the back of my neck and a wave of chills instantly sweeps over me. All of that happened when I made this shot. I can still remember that moment like it was today.